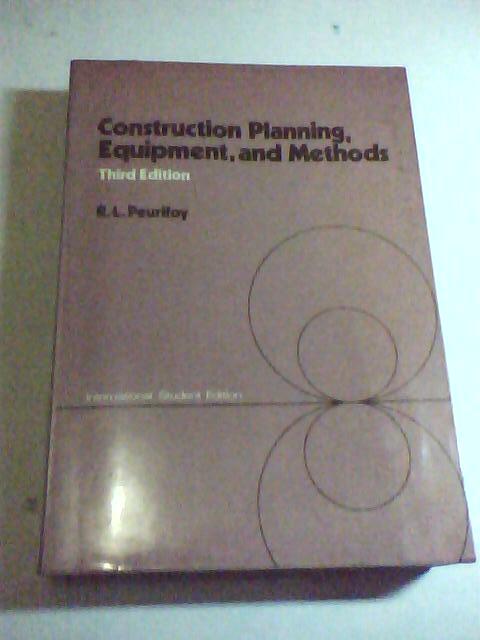 Since publication of the second edition of this book many improvements in methods and equipment have proved beneficial to the construction industry. “fie author hopes that coverage of these improvements in this, the third edition, will increase the value of the book to the reader. New material includes: expanded coverage of value engineering, soil stabilimi6m and compaction, deep soil densification, clearing land, power shovels, draglines, cranes, and backhoes; operation analyses, air compressors, rock drills and methods; new methods of driving tunnels with moles; guidance of moles with laser beams; mucking; the use of precast concrete lining segments for tunnels; improved pumps and methods for placing concrete linings in tunnels; pressure grouting with chemicals; newer types of pile-driving equipment and methods; current information on pumping equipment and on freezing cofferdams; new methods of producing aggregate; revised dimensions of lumber for use as formwork for concrete structures; and more coverage of the use of conveyor belts, pumps, and shotcrete for placing concrete. The book contains many new photographs of construction equipment and methods. Many of the tables show values in both U.S. Customary (also called English) and metric (SI) units. Appendixes are included to assist the reader in converting values from U.S. Customary to metric units. Also, other tables listing conversion factors of interest to the reader are included. The number of publications and sources of information listed under References has been increased substantially. Names and addresses of the manufacturers of construction equipment illustrated and described in the book are given as an aid to persons who may wish to contact the manufacturers. The use of generic masculine pronouns has been retained in text references to individuals whose gender is not otherwise established. It should be emphasized that this has been done solely for succinctness of expression and such references are intended to apply equally to men and women. The author is deeply grateful to the many persons who have given generous assistance in obtaining much of the information appearing in the book. Comments from readers will be welcomed.